As your little one breezes through the 8 month, you will be presented with fresh challenges !!. Your little one will start crawling, will want to explore new things, loses interest in food, doesn’t want to be spoon fed, throws things around and lots more !!! 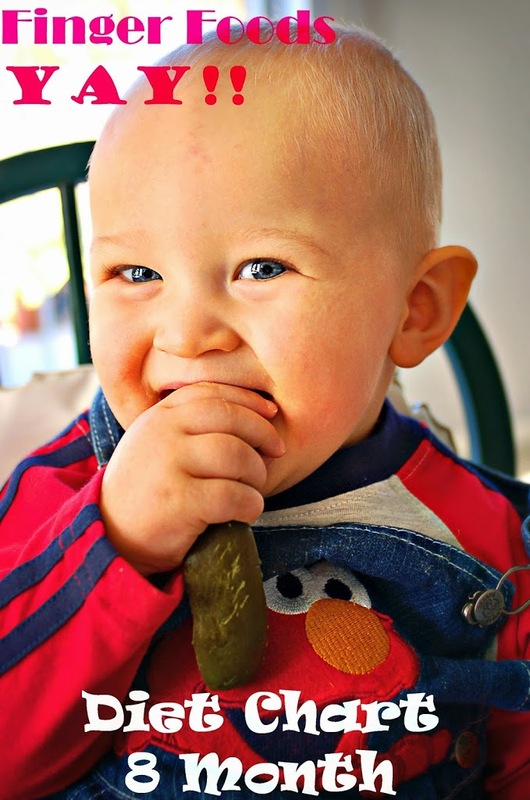 By 8 months your baby would be able to sit without support for several minutes and have developed pincer grasp (able to pick things with forefinger and thumb) This is a good sign for starting finger foods for your baby which helps the baby to explore sizes, textures, taste and feel of the food. Note -: You might be wondering why NO to Cow’s milk but YES to yogurt and cheese till 1 year. It is because in cheese and yogurt the lactose is broken down and so it is easily digestible and there is no danger of these 2 foods replacing breastmilk!! When do I know my baby is ready for Finger Foods? 1. Baby is able to sit upright. 3. Baby has a pincer grasp so that the food can be held in their fingers. 4. When the baby achieves hand eye co-ordination so that they can pick the food and put in their mouth. 1. It is best for the baby to sit on a high chair with the table while eating, as we will be able to control the messiness and the infant has a large surface to play with the food. Check out our detailed guide to selecting the right feeding chair for your baby. 2. What type of food can be given? Experts advise to give the food what the whole family has, but in India, our meals are so varied that some of the food items may not be suitable for the infant. Boiled vegetables cut into strips make great foods, evenly cut fruit cubes (apple, pear) rice sticks, preloaded spoons with cereal and lots more. 3. Be prepared for the messiness!!! 4. It is not a “Hands off” approach, with the parent as a silent spectator. The parents should guide the baby to take the food to the mouth by themselves. 5. Allow the baby to try one food at a time, for example, try apple one day and pear another day, do not combine them as the baby will not be able to appreciate and distinguish the tastes. 6. The fast foods and foods with lots of sugar and salt should be avoided. 7. Strict meal times are not mandatory, follow your baby’s cues, feed when they are hungry, do continue breastfeeding. 8. Do not cut the food into mouth sized pieces, as they will not be able to hold the pieces and gnaw on them. The guide to the perfect size will be the size of the baby’s fist and preferably chip shaped. 9. Be patient, do not hurry your baby, many of the times you will be tempted to stuff the food into their mouth!!!. 10. Try rejected food after some days, they might like it. 11. There is a very rare chance for choking, so never leave the baby unattended. 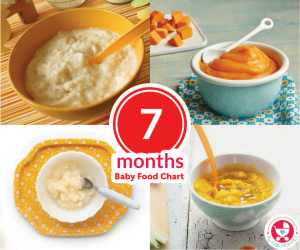 I have structured this 8-month baby food chart in such way that the baby is gradually introduced to heavier diets, so I would advise you to follow the same order. In between these meals, breastfeed the baby, please don’t stop breastfeeding as it is still the main source of energy and nutrition for your little one. For the finger foods, offer 2 or 3 pieces of FF in the beginning and slowly increase the quantity. Don’t expect your little one to polish off the finger foods at first, they will slowly explore the taste and texture of the food before eating them. 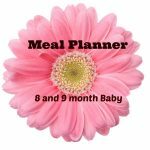 You can plan your baby meals using a Printable Meal Planner. 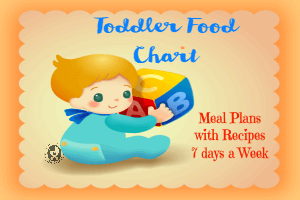 You can start a “Baby Food Diary” to keep track on your little one’s favorite recipes and allergies to specific food. Finger food options – Vegetable Finger Foods, Fruit Finger Foods.  I will be posting the recipes for all the food items listed above throughout this month, please be updated by following me on Google +, Twitter, Pinterest or liking my Facebook Page My Little Moppet. Yes dear. You can give. It’s better if home made fresh curd. Your blog is very useful. Thanks a lot. I would like to know how many times do i need breastfeed my 8 month old son? Same as before starts solid or the number milk intake will be reduce? Welcome dear, from 8 months to 1 year,Your baby should have 3 meals 2 snacks and approximately 720 ml of breast milk in a day. Frequency of feeding might be according to the demand. Thank you for creating this beautiful blog, its very useful. Is it ok to give cow’s milk diluted once or twice a day for 9month old? I would continue to breastfeed morning and night plus give him 3 meals and snack. I would recommend cow’s milk once the baby turns 1 dear. 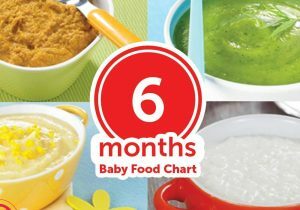 Very good meal planner i have found for my 7mnths 3weeks old baby. My baby does not breastfeed,he is on formula milk along with solid food…my concern is if I give him breakfast, mid morning snack, lunch within small intervals, when will he drink milk. 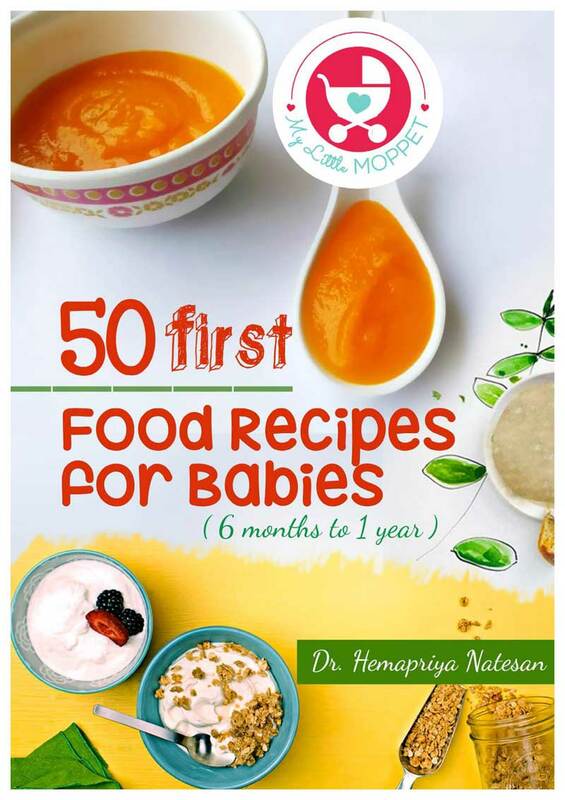 first of all thanks a ton for this amazing website for all new moms..it is so helpful that it gives to tip to toe info // i follow your diet charts and love to read your recipies and follow them..these days docs say no to salt and sugar to baby food..but is dat ok if i add jaggery instead of sugar and fast salt or rock salt instead of normal salt to my babys diet..Also i am a big fan of your oraganic powders..hv tried banana oats,brown rice (would like to mention i am unable to cook it in pressure cooker} hope ok..it wont act hard on babys tummy if cooked on gas..Somehow your instant sprouted ragi porridge didnt come out nice since it causes lot of lumps..:( cn raw banana powder be given during lunches? Pls suggest me some instant ready foods for my baby to carry when i am travelling with him..thanks a lot ..your website is a blessing.. Thank you for a warm and lovely review of our recipes and products. The idea is for Ragi to ensure it is piping hot water and you are stirring it continuously to avoid lumps. Yes you can give raw banana powder as lunch, provided you are also giving other variants of food to the baby. Since an overall nutrition is must and you must keep giving other varieties too. Why do you have mid morning snack and afternoon snack in 8 months schedule? Can we not serve just breakfast lunch and dinner; and formula/bf in between the three main meals? 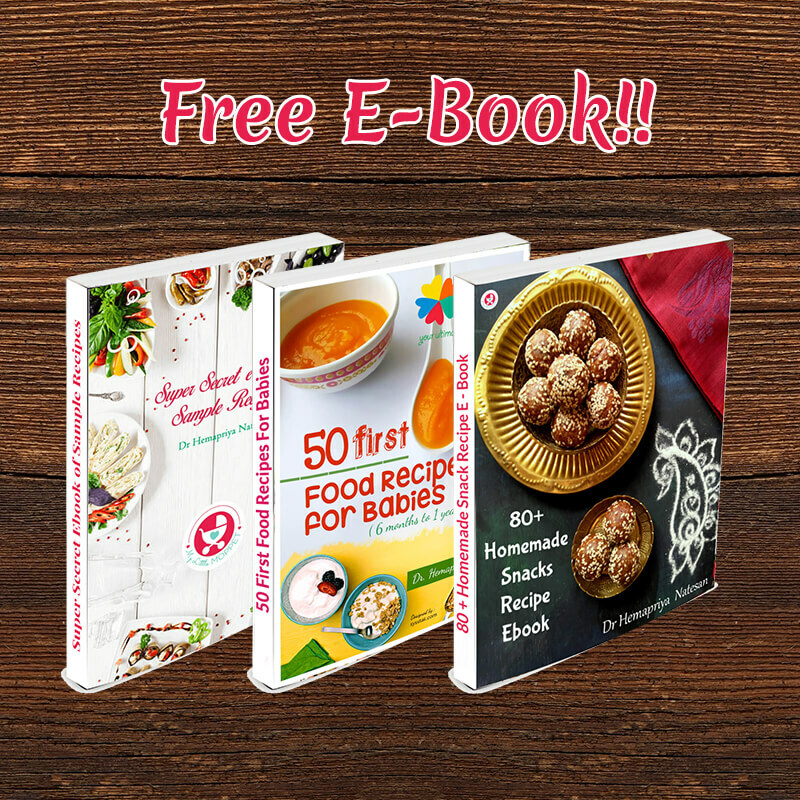 I am a new member here and what to understand if i want to follow your food chart for my 8 months old baby than at the same time how can i follow the 3 day rule for each recipe. my baby is currently 10mon old. she often vomits particularly at the end of the day or during nite meal. when she vomits, she also vomits that she ate in the afternoon. I m worried that she will not get the required nutrition. I feel this is because of some improper digestion. please suggest how can I overcome this. 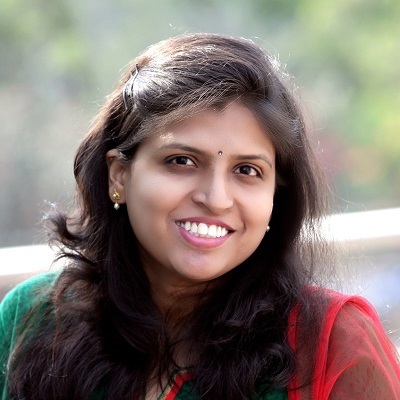 hi hema,i had a doubt.my son is 8month old can i give sooji gheer to him.whether i want to give white rava or wheat rava? my baby is currently 7 mon and 3 weeks old. I m. nor sure whether to follow 7 mon diet plan or 8 mon diet plan. also in 8 mon diet plan., it is specified to introduce egg after 8 mon, but in the chart I see egg related items. so I m. bit confused. please help me. My baby girl just turned 8, i followed diet plans for 6 and 7 month as you have advised on your site. I am extreme happy to discover your website. Thank you so much. Today is first day of 8th month and 1st week of 8 month diet plan. My baby hasn’t got teeth yet. Can my baby easily have steamed dosa, idli, pancakes etc? Where should I include formula milk timings? and how much shall i give. I have just 2-3 days more to start my full day job. Please help me out. Hi Hema, what should be the serving size of khichdi, porridge or kheer for a 8 month old and by how much to increase it every month? Hi Hema. 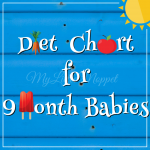 My daughter is 8 mths old and hv started your diet chart. She loves your recipes. Thanks a lot . Just wanted to kno d recipes for fried cauliflower and plain pancakes and and does bread ff means bread sticks dat v get in d market?? Hi Hema ji, when you say cheese, you mean paneer or cheese slices? All types of cheeses (except paneer) have pre-added salt in it. Is it OK to give cheese that has salt in it to 8 month old baby? Also, can i introduce gram flour to my 8 month old baby? Can I give boiled chana as well? Hi hema m my dear son 8month s old.i tried broccoli wth cheese ,but he don’t want to gulp.pls introduce some interesting recipes with broccoli. & Thanks for yummy recipes .